I played on Evo roulette at weekend. Try to test palestis system on there. I noticed that 2 guys won a decent amount (66K and 42K) but couldn't realize their way of playing maybe on a number or zone. The interesting thing is that i was on progression of palestis system and waiting for a win. When i was winning they had no win when i was on progression and not win, they won. It's opposite relation with palestis system. I picture won at zero zone but wonder any system number based or zone(region) based. Couldnt realize the whole picture of how they were playing. Number history is limited but could you share your opinions according to screenshots? Numbers history can go back to 500 spins, using the horizontal slider below the wheel statistics. Truth is, I have experienced very strange results (over hundreds of spins) in each and every online and land based casino I have played at. 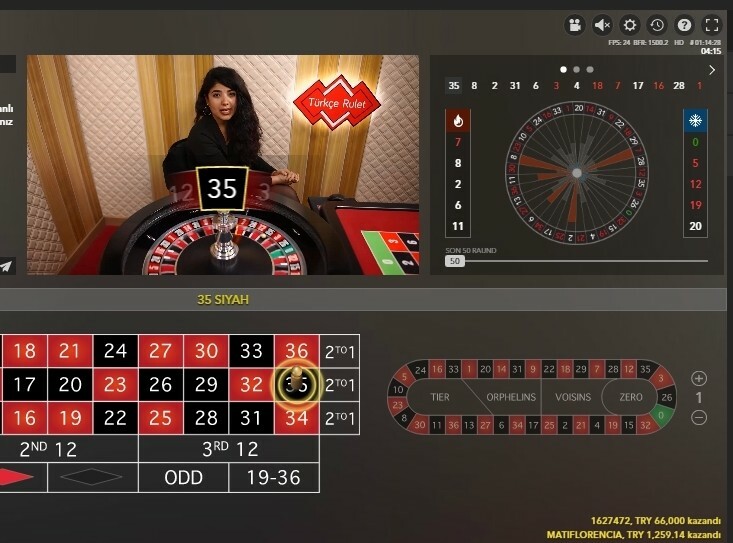 Evolution has a very good name and reputation as a live roulette platform and it holds the top position in our comparative review of all roulette platforms. Nice remindings about Evo Roulette. I also fan of them. And i know all specs of the site such as 500spins history. My point is that there must be a reason that few guys won a lot at those numbers. Couldnt realize the whole picture maybe some expert player have opinions about system or method. Clues are few cos couldnt take the screenshot of whole 500spin or at least 100. Just 13 numbers available and very difficult to guess what was going on there but the point is two guys only won when i was on progression at palestis system so it should be an opposition each other. Sometimes we are lucky!! A method can help only if the weel obay! Which the wheel do not do long! Handle 500 spins against and still win, that is good and seldom fail, if it has a cost. What's the url to this live casino? I'm at their website but unable to find a link to launch the live casino. You just saw the payout those guys had on that particular spin. being paid 40k, do not mean they bet less than that. They could have bet 100k, and in return, they recive 40k. Not different than betting 100€ and being paid 40€. I played on that one. .. they show correctly for me. No one can say they have no their players to bet high and win sometimes... just to incentivate others to bet higher. However, if someone pay attention, he can rather precisely say wich player play what and kind of progression used. They got good wheels . Live roulette without real players is from my point of view not fair live. Casinos write there own reviews and the fake large results of invisible players must invite you to play. Changing pictures make it possible to cheat. Live roulette has many tricks to disturb your concentration. The very short bet time is also a disadvantage for the player. The croupiers are like robots and they spin without passion. They have EMF (electromagnetic field) so they can rigged whenever they need it. begin to apply your progression. They can accept all your losing bets and when you come to 9th or 10th of your progression (waiting for a possible win) they generally cancel your bet or not accept at that round so your past actions has been ruined in that scenario. I experienced it many times so real one is utterly and totally real than online.